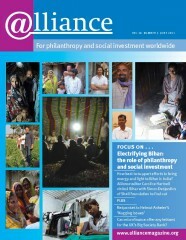 How can philanthropists and social investors most effectively support development? Taking one area and issue as a case study, Alliance editor Caroline Hartnell and guest editor Simon Desjardins of Shell Foundation went to the Indian state of Bihar to visit the social entrepreneurs who are striving to bring electricity and light to remote villages, and to see how their efforts are changing the lives of local people. They also talked to many of those who support them such as Chris West of Shell Foundation and Vineet Rai, founder of Aavishkaar, Intellecap and IntelleCash. Lessons learned here can be applied to many other areas of the world. The feature includes in-depth case studies of two leading Indian social enterprises that have great potential for scaling up, Husk Power Systems and Greenlight Planet, including comments from current and potential investors. Based on conversations with those working and investing in the area, the feature examines the opportunities and challenges for both entrepreneurs and investors, and looks to what the future might bring. Further articles look at the role of government and the links between energy provision and development. The June issue of Alliance also includes an article by Rebecca Adamson about recent developments aimed at helping Indigenous communities, an account of a novel microfinance guarantee system, and further opinion columns, articles, reviews, conference reports and global updates. Why are they funding Husk Power? Energy access and development: how are they connected? Avoiding ‘mission drift’ – lessons for the Big Society Bank? Take the message to heart, but don’t get upset!